This Modern Tall Bookcase will fill that spot that needs something sleek, aesthetic, and stylish, but still practical. 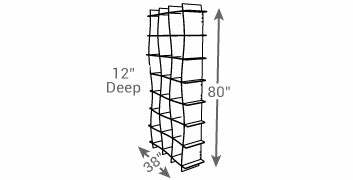 Maximize your space with this modern and minimalist floor to ceiling bookshelf. It is perfect with space for books, photos, etc. Tall and thin, it fits well into small spaces, providing an extra splash of style for your living room, recreational room, bedroom, or kids’ room. Compatible with our decorative storage bins, this tall bookcase takes on a new dimension, and wows your company with your ability to decorate, organize, and be eco-friendly all at the same time. Talk about multi-tasking! Follow us into the kids’ corner of the house, and your new tall bookcase with its set of decorative bins looks at home holding dolls, cars, paints, and clothes; anything little hand need. The bedroom, play room, nursery, and school room will not be complete without it. Our sprout tension lock tool-less technology allows the 21 cube white tall bookcase to assemble in minutes without tools or hardware, and disassemble for storage just as quickly. The tension cord backing provides structure and stability, and the ease of dis-assembly makes them light and easy to move. Wherever you go, they can come right with you. American made and eco-friendly, you won’t want to leave them behind. Set includes: (1) Mid Century Bookcase, (1) Wall Anchoring Kit & (4) Tensioning Cords.